All might have experienced toothaches, from mild soreness to an unbearable acute pain in teeth or your jaws. You feel the pain when the pulp, the central region of the tooth, becomes inflamed. The pain may be due to other reasons also. The toothache may be due to following reasons. Ear infection: The infection in ear infection, the pain may spread to the jaw and teeth, resulting in the toothache. Sign of pregnancy: hormonal changes in body during pregnancy can cause toothaches due to tooth decay and gum disease. The pain in tooth may be due to serious reasons such as cavities or erosion of tooth enamel, or it may be very serious like an abscess or chest pains. A toothache signals that something is wrong., if left untreated it can lead to serious health problems. On the first signs of pain, people generally think of some quick cure at home. They defer the visit to the dentist. You may try some of the natural remedies given below to get temporary relief. Following are the most popular DIY toothache remedies believed to work. Below are 12 home remedies to help you relieve your pain in teeth. Cloves have anti-inflammatory and anesthetic properties that help alleviate tooth pain and fight infection. To get a toothache relief, drip a drop of the oil on a cotton ball and apply it to the tooth. I used sometimes this remedy, but I accidentally touched it to my gums and tongue, so I got some pain for some time. Instead mix a few drops of clove oil in some water and use it as a mouth rinse. You can also grind a few cloves in some vegetable oil and apply on the affected tooth. Onions have antiseptic properties that can kill the germs causing an infection, so chewing raw onion can provide relief from tooth pain. Peppermint has numbing properties, so it can be useful for treating pain in teeth. Apply a warm tea bag on the throbbing area for 15 minutes. You may get some relief so long as the tea bag is in place. Swish a small amount of salt water in your mouth for half a minute. Hydrogen peroxide can kill bacteria so using it (4 percent solition in water) can be an aid in reducing the pain. It can help prevent gingivitis (gum disease), which is a potential cause of toothache pain. Do not use undiluted hydrogen peroxide, otherwise you will burn your mouth and be careful not to it, to avoid any stomach problems. Garlic has antibiotic properties and other medicinal properties so it can inhibit the growth of bacteria in your tooth and can be very effective in reducing the pain. Make a paste of garlic with salt and apply it to the problematic tooth. Or you could chew a clove clove directly. Pepper and common salt possess antibacterial, anti-inflammatory and analgesic properties. So a paste of these herbs can be of immense help in curing a toothache. Make a paste by mixing pepper powder and salt in equal amounts with a few drops of water or olive oil and apply on the affected tooth. You can empty a teabag and put half teaspoon each of salt and black pepper and staple it. Put the bag in olive oil or water and then place to my sore tooth. You may also add some crushed garlic to add more antibacterial power to the pack. Add a pinch of powdered asafetida to a teaspoon of lemon juice and apply to the problemtic tooth with a cotton pad. If your teeth is sensitive to lemon, then fry some asafetida in ghee (clarified butter) and apply. Take some neem leaves and crush them and put it on the affected teeth. Or chew some neem leaves. Spit it out after some time. The antibecterial properties of neem will destroy any bacteria in tooth and gum and reduce the pian. 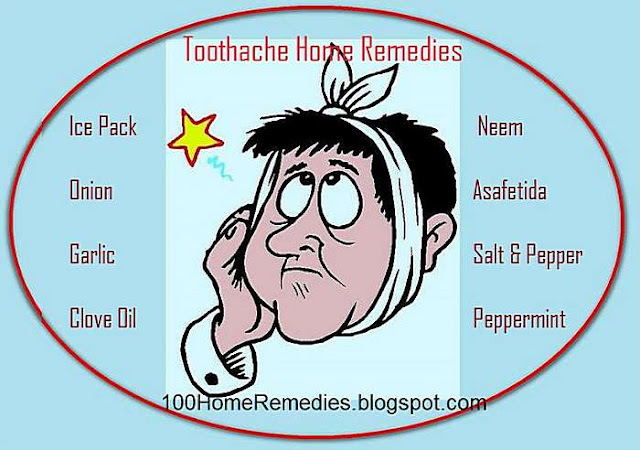 Verdict : Do Toothache Home Remedies Really Work? But do they really work? Are they effective? None of these are scientifically proven to ease your tooth pain permanently, although many users have reported to have been relieved of their pain using these home cures. I had toothache many times in my life and I had tried all the remedies one time or another. They subdue the pain some times for pain due to minor infections in gums or teeth, but the fact is for severe pain due to abscess, I had to visit my dentist for a permanent relief. Note that once the toothache starts, it will never go away of its own. Temporarily you may have some relief, but for the permanent treatment, the best toothache remedy is seeing a dentist, because it is important to treat the underlying cause of pain. If you have swelling in or around your mouth, contacting a dentist should be your top priority. You can Comment via Google+ or Others and also View Comments by clicking on the following. All the remedies and tips given on this blog here are strictly informational suggestions and not intended to provide medical advice. This blog is not intended to diagnose, treat, or cure any disease. None of these statements have been evaluated by the FDA. Consult with your Doctor before using any of these tips, remedies or treatments. Copyright © 2016 www.100HomeRemedies.info. Powered by Blogger.